The idea that tiny songbirds that weigh far less than the change found in the average pocket manage to migrate 600 miles across the Gulf of Mexico was long considered fanciful. It was assumed that a few, at most, might make such flights, but most birds were thought to be circum-gulf migrants rather than trans-gulf migrants, and the lack of data to back this up was ignored, papered over, or not thought about. Eventually, of course, folks figured out that a wide variety of neotropical migrants do make that absurd flight over the Gulf of Mexico from the Yucatan Peninsula, taking advantage of prevailing winds and landing, something like eighteen hours later, on the coast of east Texas and western Louisiana. 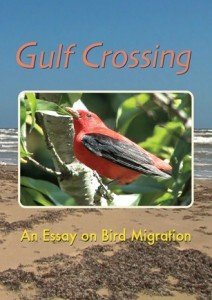 Gulf Crossing: An Essay on Bird Migration is a documentary that explores the phenomena of trans-gulf migration. As a documentary it adequately describes the perils that birds face on their long journey north from their wintering grounds in the neotropics. The relative advantages and disadvantages of circum-gulf and trans-gulf migration are explained well by Jim Stevenson, a biologist from Texas who serves as director of the Galveston Ornithological Society and is the only person to appear on-camera in the film, and Jackson Childs, who wrote, produced, and narrated the documentary. The interplay of weather, geography, and evolution is illustrated nicely with a variety of animated maps, and terms like Nearctic, Bermuda High, and fallout are all explained in easy to understand ways. The information in the film is likely to be mostly familiar to experienced or well-read North American birders, though at least a tidbit or two will be new, and new birders or non-birders will have a treasure trove of knowledge to cram into their skulls. Of course, what makes a movie, even a documentary, memorable is the images, and Gulf Crossing has some pretty impressive footage of migrant birds, especially the ones that people most want to look at, like tanagers and wood-warblers. 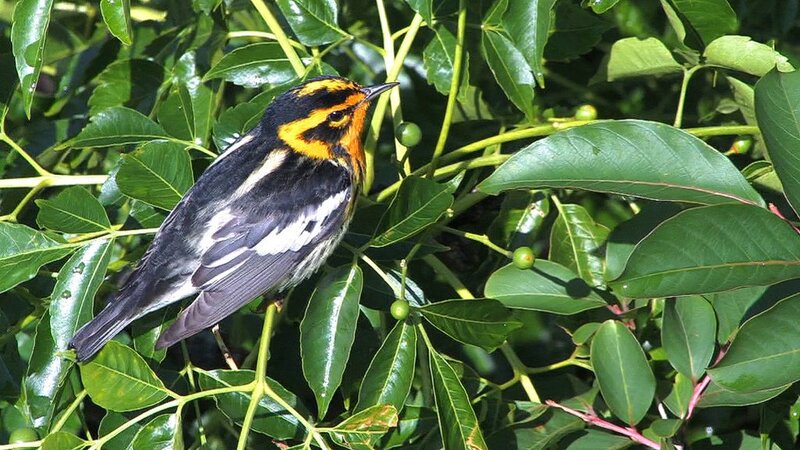 I know how difficult it can be to get a good photograph of a foraging wood-warbler so it was impressive to see solid video footage of a variety of species, including birds Cape May Warbler, Tennessee Warbler, and Bay-breasted Warbler. Some of the shots of Scarlet Tanagers will make you want to simultaneously gasp, laugh, and cry, while the opening shots of a circling Swallow-tailed Kite and the closing shots of a Common Nighthawk in flight will inspire you. The film is worth watching just for the bird footage, even without the narration, though, of course, I am a birder and spend my spare time finding birds to look at so take that judgement however you like. To get this amazing footage some travel was required, and I am sure that it broke poor Jackson’s heart to have to visit places like the Texas coast during the peak of spring migration, the Florida panhandle in the fall, Mt. Auburn Cemetery in Cambridge, Massachusetts in May, and Sterling Forest State Park in New York during peak breeding season for wood-warblers. The scenic shots, which are often interspersed with tight shots of foraging or singing birds, are gorgeous as well, and one gets a real feel for the locations at which the film was shot. Sterling Forest, the only location at the film that I had visited myself, was instantly recognizable, and anyone else who had birded the power-line cut looking for Golden-winged Warblers would know the spot as well. Of course, any review of a film must point out some shortcomings and there are several that did bug me about Gulf Crossing. Far too many of the birds in the film are not identified, which, to be honest, was not a problem for me because they are species that I am familiar with but I would think that a novice birder or a non-birder might like to know which brightly-colored bird is on the screen. And, while the footage is almost universally excellent, it is sometimes spliced together seemingly at random, so you jump from one three-second clip of a bird foraging to another, with no real understanding of why you are looking at one bird or another. There is at times too much information presented, like when the reversed gender roles of phalaropes are discussed, a topic completely unrelated to the ostensible purpose of the film. Time spent discussing issues like phalarope gender roles, and time spent sharing footage from the Adirondack Mountains, Sterling Forest, and Mt. Auburn Cemetery might have been better spent detailing more aspects of the actual gulf crossing, like exactly what species cross exactly when or perhaps an exploration of the role that boats and oil rigs play when the birds hit a cold front on their way across the gulf. While Gulf Crossing is not perfect, which is only to be expected from a low-budget, first attempt at film-making, it does provide some excellent footage and a good overview of how bird migration over the Gulf of Mexico works. I recommend it for anyone interested in learning more about the marvels of migration or anyone who just likes to see good video of birds. Disclosure: Jackson Childs was kind enough to provide both a review copy of the video and another copy to give away to 10,000 Birds members. Keep an eye out in the next couple days for the giveaway details! Jim Stevenson has became a friend of mine these last few months and gave me a copy of this documentary. It is very informative and there is some great songbird footage! I recommend it to anyone interested in bird migration or just cool bird footage!